1. Keep it uncluttered, clean and fresh. Dust, dirt and messiness affect the energy of the home and anyone in it. 3. Ahness. Let it breathe. Leave spaces between artwork on walls, between pieces of furniture, between walls and furniture. Keep it free of overworked designs. Make sure the eyes flow easily from one area or item to the next. 4. Vibrancy. Open your home to sunlight, color, rhythm and flow. Keep in mind that colors can calm, excite and stimulate. It is good to identify areas in your home where the qualities of colors are best suited. 5. Coziness. Create cozy spaces that are comforting and nurturing. 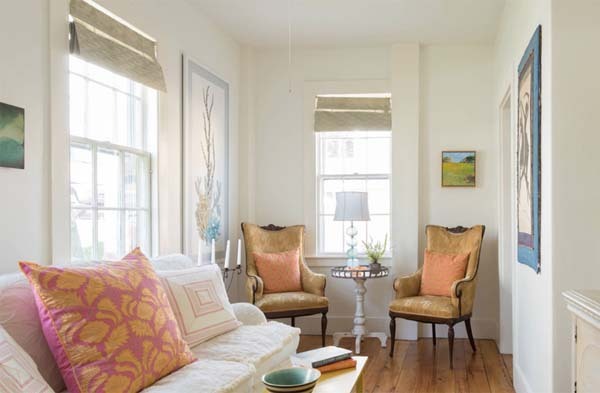 Chosen correctly, wall colors, window treatments, flooring and decorative accessories have a way of filling a room. Much can be said for the careful placement of furniture and decorative objects. Arranging and rearranging until you can “feel the harmony and balance” is essential to creating a cozy interior. 7. Delightful. Using decorative accessories artfully, is like plating a wonderful dish. They can enhance the visual links in the room, balancing color, texture, lighting and other elements of design. Nothing spells bland like blank walls and lackluster furnishings.